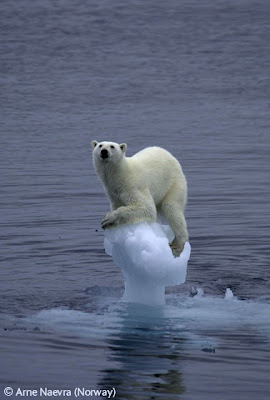 Polar bears could be extinct in 100 years if climate change continues to melt the North Pole's ice. The North Pole's 'permanent' ice is melting by 10% each year and is likely to speed up as the white ice no longer reflects the sun's heat. Bears need the ice to feed. They can smell the seals under the ice and can break through it to catch them, or just wait for them to come up for air. Polar bears have always been able to survive the summers with little food, but now, with longer between the ice forming, they are suffering and getting a lot thinner. Starving bears have fewer cubs and are more likely to come to human settlements searching for food on dumps etc. Here they will be more at risk from humans. Posted by DaniiB at 5:37 p.m.
Gaby Cordova December 17, 2009 at 6:33 p.m.